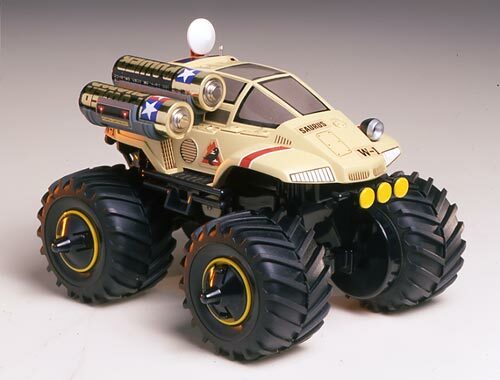 【 Monster Truck From the Future! 】 This plastic assembly kit features 4WD and large-diameter tires to enable exciting wheelie and two-wheel driving action. The motor is mounted at the center of the chassis and provides power to the front and rear wheels via a sidewinder gear setup. The comically-styled body features futuristic touches such as the headlights, radome, armor panels, and antennas, and the model's easy assembly does not require any cement.